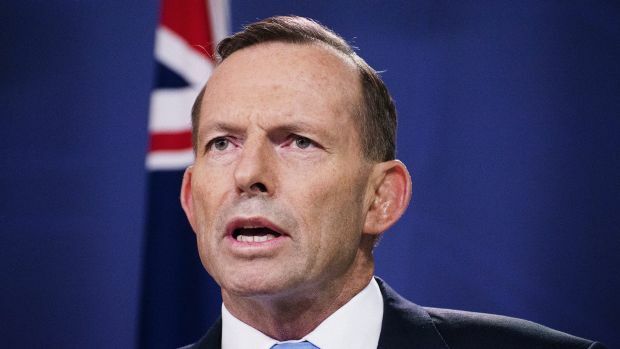 Tony Abbott claims he should remain PM because he's strong on defence, security and foreign affairs issues. Personally, I don't believe so. As this article for todays Canberra Times suggests . . .
On Monday, in the speech in which Tony Abbott began his desperate bid to retain his Prime Minister-ship, the first subject he turned to was security. "These are testing times for our country," he said, quickly cataloguing the conflict in the Ukraine; the rise of a "death cult" in the Middle East; and terrorism at home as imminent threats to our way of life. The implication was that he is best placed to deal with these challenges. However, there's a growing consensus among analysts that instead of resolving crises, Abbott's instinctive actions are making them worse. Like an old boxer, the PM always wants to act, to actually "do something". Yet instead of diffusing conflicts this often escalates them, resulting in policy incoherence and danger. When Cabinet's national security committee met in the wake of the shooting down of MH17, for example, Abbott's first instinct was to send a battalion of troops to defend the police investigators. He was persuaded not to: our soldiers would have needlessly provoked the Russian-backed rebels without being numerous enough to protect themselves. But Abbott's tendency to speak without thinking was about to come unstuck in a far more dangerous part of the world. The revolting and gruesome images of barbarity coming from the Middle East touched something deep in Abbott's psyche. He again needed to act immediately and within days a military contingent was on its way to the region. Unfortunately he'd failed to check with the Iraqis first. While the Baghdad government was happy to accept some support, its enthusiasm turned out to be highly qualified. Iraq still refuses, for example, to allow our jets to be based in the (safe) south of the country. This means pilots must fly an extra 2½ hours simply to get to the operational area and the same time returning from the mission, quite aside from the additional expense. Abbott hadn't accepted advice that Baghdad itself was never in danger of falling to the insurgents - that's why the Iraqi's initially refused to allow our soldiers in to the country. Australia's precondition for their deployment was a "status of forces" agreement - offering legal indemnity if they accidentally killed a civilian. An understanding on this vital requirement has still not been reached and, as a result, our troops are still, incredibly, bearing diplomatic passports.The Canberra Times understands this is one of the key reasons they are still not forward deployed to combat Islamic State. Instead they're still in the sprawling compound around Baghdad International Airport known as Area Four. Here they simply train new recruits for the Iraqi Special Operations Forces. This is a worthy and necessary task; it's also a far cry from the original mission. What our troops are doing is also very different from the support being provided by other countries in the international coalition and that's again attributable to Abbott's actions. Canadian special forces, for example, are engaging in firefights and have been heavily involved in the vital mission of calling in coalition airstrikes against extremists in the Kurdish region in the north of Iraq. This has enabled Peshmerga to push IS out of the small town of Kobane, on the Turkish border. Meanwhile, in the south of the country, the commandos our troops are supposedly advising are heavily engaged in another desperate battle. The Balad district, 80 kilometres north of the capital, had been abandoned to the rebels when Iraq's 10th Brigade fled after losing just 11 soldiers. This week the UN revealed it had received reports that IS had crucified and buried children alive after capturing areas from the government. A costly battle to retake the region ensued. Videos of Iraqi Special Operations Forces' black vehicles show them spraying fire randomly as they advance. While nobody can doubt either the intensity of this fighting, its viciousness, or the experience of the ISOF, whatever skills the Australians are teaching appear to be quickly forgotten in combat. The Iraqi vehicles bunch up and their soldiers fire wildly in the air, seemingly failing to use basic fire and movement tactics to close with insurgents, which suggests that little has so far been accomplished by their deployment. An important part of the reason our forces haven't been welcomed is also directly attributable to Abbott. Late last year, Australia (unlike Canada) joined the United States in vetoing a UN resolution censuring Israel. Diplomats insist this has exasperated Baghdad and explains in part the Iraqi government's unwillingness to embrace the assistance the PM's offering. The third question mark that's being raised over Abbott's judgment relates directly to domestic security. Although ASIO has increased the threat level the country faces, it's understood this reflects, in part, the organisation's concern over it's inability to properly monitor what's occurring rather than increased danger. In the meantime, the PM's been intensifying divisions and highlighting risks that don't necessarily exist. Security analysts aren't accusing Abbott of manufacturing the security challenges the country faces - but they're not convinced he's the right person to deal with them. It seems likely the Liberal party room will agree when it meets next week.